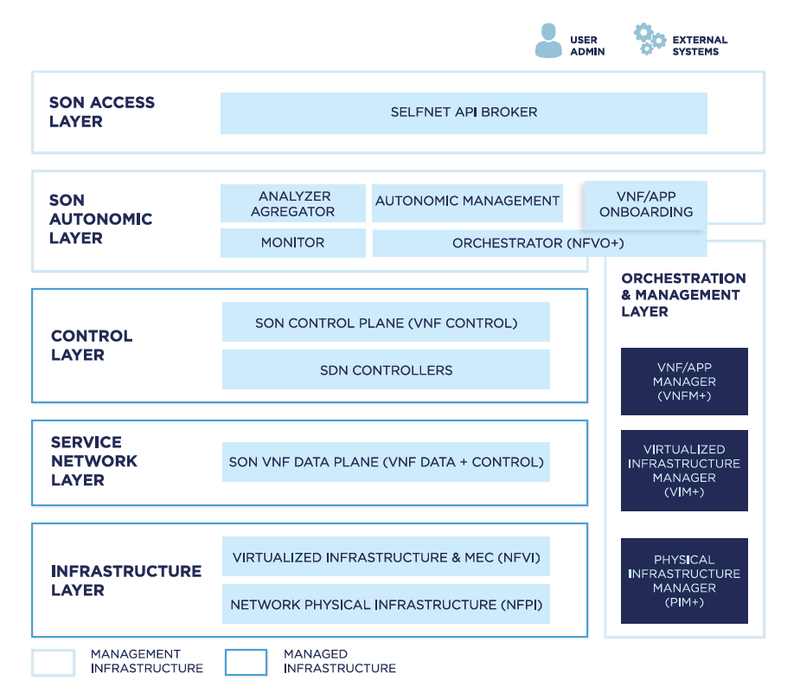 SELFNET is a project focusing on 5G network management, with the main objective of developing an efficient self-organizing network management framework for 5G through the combination of a virtualized and software defined network infrastructure with artificial intelligence technologies, pursuing an automated network monitoring, an autonomic network maintenance, an automated deployment of network management tools and an automated network service provisioning. SELFNET is driven by use cases designed to address major network management problems including Self-protection capabilities against distributed cyber-attacks, Self-healing capabilities against network failures, and Self-optimization to dynamically improve the performance of the network and the Quality of Experience (QoE) of the users. During the first two years of the project the overall SELFNET architecture has been continuously refined, including all the components, interfaces, information model and autonomic control loop. SDN/NFV sensors and actuators are being integrated in prototypes through an APP Manager. The architecture involves aggregator, analyser, autonomic manager, rule based tactical autonomic language and orchestrator which have been integrated in order to close the autonomic control loop. The full integration of all modules, including a Graphical User Interface for the administrator, in a testbed running the infrastructure is being the main task in this third year of the project, together with testing and validation. SELFNET has the specific objectives of designing, implementing and validating a self-monitoring and detection subsystem, a distributed Self-Organising Network (SON) autonomic management engine subsystem and a SON orchestration and virtual infrastructure management subsystem. Through these automated and intelligence-based operations, SELFNET primarily contributes to significantly reducing service creation time in software-defined and virtualised 5G networks. Moreover, SELFNET expects to help in realising the creation of a secure, reliable and dependable network with a “zero perceived” downtime for services.